Well, I’m going to try and actually WRITE a post, instead of just putting up photos. I feel like I’ve had lots to say, but no time or energy to say it! First of all, I’ve started a training course to become a doula, aka birth assistant. I’m so excited about it! 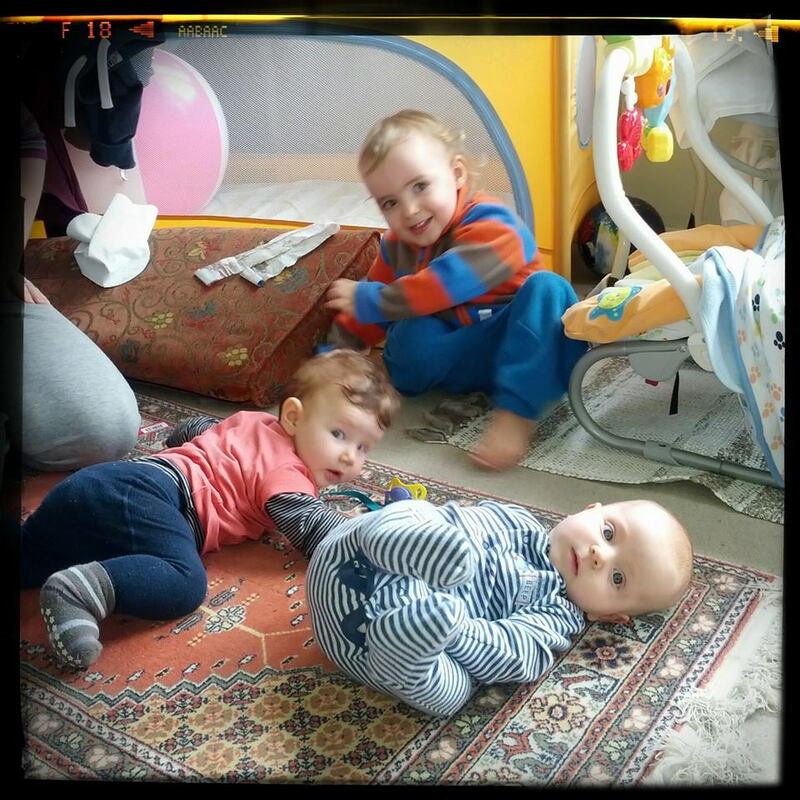 I had two such great doulas for Liam and Fred’s births, and their help made such a big difference in how I experienced the births and the overall outcomes, I basically want to be able to give that same help, encouragement and care to other women during their childbearing experience. Right now I’m doing some online studying, learning lots about the physiology of labour and birth, as well as lots about nutrition during pregnancy, routine hospital procedures during labour and birth, managing pain in labour, breastfeeding, etc. It’s so fascinating and I love it! I never would have imagined I’d find this stuff so interesting until I started doing research when I was pregnant with Liam. Since there’s such a high c-section rate here in Turkey, I was really nervous about what would happen when it came time to give birth. I wanted a natural, unmedicated birth and the more I read, the more I was convinced that that was the best option for me, and with some luck, a few helpful connections from friends, and a bit of persistence, I found a way to have a natural birth here, and in the meantime, found a topic I’m pretty passionate about! Anyway, it feels so refreshing and energizing to be starting on a new path. I haven’t decided that I won’t go back to secondary school teaching in the future.. it’s just that with the uncertainty in the job market, I don’t want to have all my eggs in one basket. It feels great to be taking a real step to hopefully giving myself a better chance of finding work when we leave Istanbul. If I can get started as a doula when we get back to Ireland, I have a sort of multi-step plan for the next few years… I’d also like to train as a breastfeeding counsellor and childbirth educator. I’ll still be in an educational role, working with women and their families in a caring and supportive role, doing something important that I can feel good about! The brilliant thing is that, even if I end up as a secondary school teacher, I could still do some of this birth related work too, maybe not much, depending on my schedule, but a bit here and there. So, either way, it’s a win! Besides new job/career options, the other big thing is that Richie and I are planning to move back to Ireland next year! Richie’s brother is getting married in June and his sister in July, so we’re going to be spending a bit of time back there anyway for the weddings, so we decided we should try to find work while we’re there. It’s nothing against Turkey… Istanbul has been very good to us. But at the same time, I miss Ireland and with two little boys, it’s really hard to be so far from both our families. And I suppose, realistically, it’s time we got going on a more sustainable way of life. It’s been great here, Richie having so much free time to be home with us, having a comfortable standard of living on such an easy work schedule, etc. It’s been a great few years and I’m really thankful this is how we got to start our family. However, in some ways it feels like things have stagnated and we need to make a change. Also, there will be other things to think about in the not too distant future, like Liam going to school, us needing to save a bit of money, have insurance, more stable jobs… grown-up stuff like that. Basically though, it just really feels like it’s time to start a new stage of our lives. It’s a bit terrifying at the moment, because we have no idea if we’ll be successful in finding work or what exactly what is in store for us in the next year or so, but it’s exciting and it’ll be so great to be home, with family and some of our closest friends, and all that kind of thing. Hm, I guess that’s about it for now. Fred’ll be awake soon and Richie will be back from work any time now. Tomorrow afternoon/evening, we’re hosting our little Pre-Christmas cookie party with a few friends, so I’ll be heading out when he gets home to get some delicious cookies from the bakery, some wine and odds-and-ends for mulled wine, and that sort of thing. Yum. I’ve never made mulled wine, but I’m really looking forward to giving it a go and having such an indulgent festive treat tomorrow. I think it’s going to be a mix of this recipe and this recipe, so we’ll see how my improvised version turns out! Also, I know one of our friends, Marijke, has been slaving away in her kitchen, making about 5 kinds of treats for tomorrow and I can’t wait to eat all those goodies!!!!!! On that delicious note, I shall finish up here! Hopefully I’ll have some cute Christmassy photos of Fred and Liam soon! But first he builds them, on his bed. Having our double size spare mattress on the floor in his room has been the best thing ever! It makes such a great place for him to jump and tumble and we take naps with him there too. So, one of his latest things is to pile up all the pillows and cushions in our flat and then throw himself on them very dramatically and flop around the place. Endless fun, and luckily, not too many bumps and bruises so far. Little Fred has been having a great time with his feet lately. It’s nice he has a form of entertainment that is always with him. He nearly got his toes to his mouth the other day, but didn’t quite make it. I’m sure that’ll come soon. On another note, I think Fred is a long baby, and bigger at this age than Liam was. He’s not a chubby guy at all, but length-wise, I’d say he’s just about to upgrade to 6-9 month clothes already! Liam was always right in the target size for his age, so it really feels like Fred is flying through the sizes at the moment! 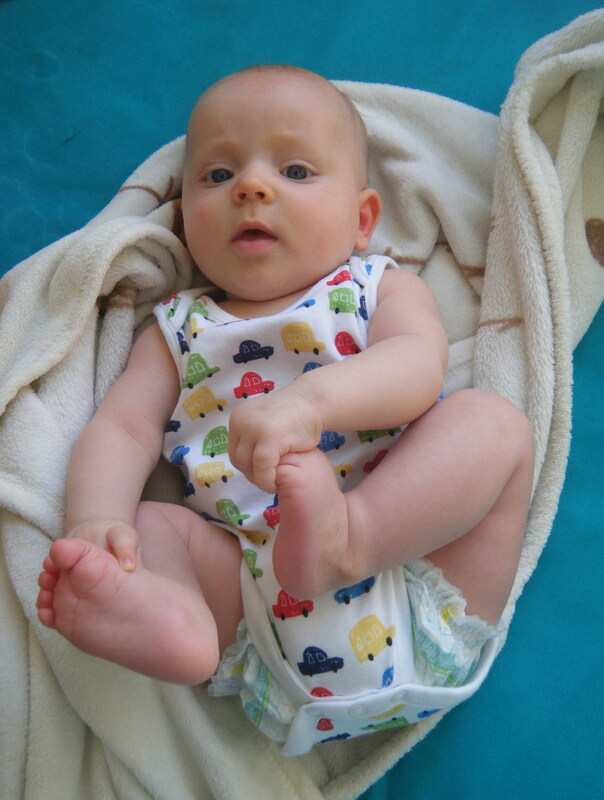 Oh, and I finally got him into cloth nappies! It took me long enough! He’s been in them on and off for a few weeks now. I do really like using cloth diapers and all the cute diaper covers we have, and since he’s doing just about all his poops in the potty, it makes diaper washing easier too. I haven’t had to clean up a single poopy cloth diaper yet (touch wood!). I still have days and parts of days where it’s back to disposables though. Sometimes I’m just too freakin’ tired to care, and it’s nice that I have that back up. I’ve also been using disposables at night because it’s just easier. Well, were to begin? I’ve decided to write a few ‘mini posts’ and try to do my long overdue update in lots of small pieces, so at least some info gets out there, because otherwise it takes me like two weeks to write a post! First of all, things are good here. Fred will be four months old next week! He’s absolutely adorable and such a smiley guy. Love it. What I’m not loving at the moment is his crazy night-time sleep. He’s actually rolling over already, from his back to his front, and I think because of this developmental milestone, he’s sleeping pretty poorly at night. He just wiggles and wiggles. Plus, with the whole rolling thing, that means that the days (or nights) of him being all swaddled up are pretty much over. I still wrap him when he sleeps next to me, but since I’m there to mind him and make sure he doesn’t end up with the blanket over his face or anything, it’s okay then. But since he’s so wiggly, he just doesn’t stay swaddled very long and it’s all just a mess. Blah. Last night Richie and I spent a while in the evening discussing things we could try to improve the sleep issue, but I have a feeling we just have to wait a week or two and let it sort itself out. Last night I decided to try helping Fred do his pooping a bit earlier in the night, since he wiggles so much I thought maybe that was his problem. So, I nursed him in bed, and when the tossing and turning started, let him come unwrapped and wake up fully. He did, in fact, do his poop in the trusty ol’ potty bowl, and I thought I would be back to sleep with him in no time! However, he had other plans. It turned out to be our ‘worst night ever’ with him and I awake for 2 1/2 or 3 hours. I did a lot of cursing under my breath and muttering, but eventually he fell asleep again and we’ve been catching up on sleep all day! Boy, aren’t I complaining a lot! Sorry about that. Apart from the sleep drama though, life is good. The weather is finally getting cold here, but we’ve had some really sunny days, so those are nice. Considering it’s December 1, the weather’s really good. We had a pretty good week last week, with some outings and lots of visitors. Monday is now ‘Meet up with Marijke Day’, on Wednesday we had a visit from a new friend Anne and her baby Sara in the morning, and Katherine and her little guy Daniel in the afternoon, and then Friday myself and the boys headed over to Katherine’s with the help of our friend Zahra. So, the week was busy and fun, which was good. Okay, Fred’s just waking up now! Post over, but more to come soon!!!! I can hardly believe it, but this and the previous video are about a month old already! Need to get something more up-to-date!